INDIANAPOLIS (January 7, 2014) — Klipsch, a leading global speaker and headphone manufacturer, today unveils the KG-200 and K-300 Wireless gaming headsets at CES 2014 in Las Vegas. As masters of headphones and the number one provider of professional cinema speakers, Klipsch’s acoustic geniuses have developed the most powerful and detailed gaming headsets in the market. Designed for use with PlayStation 4, PlayStation 3, Xbox 360 and PCs, the products enable enthusiasts to dominate opponents with an audio advantage that shifts the game in their favor. Bringing decades of acoustic prowess to the world of gaming, the wired KG-200 gaming headset provides listeners with athletic mesh ear pads for long-term wear, comfort and breathability while still providing superior levels of noise isolation. Equipped with 40-millimeter precision-tuned drivers and four selectable EQ presets (Fidelity, Combat, Stealth and Sport), the headset delivers optimized sound for every game type. Large, easily-accessible controls are located on the right earcup for controlling EQ, chat volume, game volume and mic monitor. The KG-200 retails for $129.99 (U.S. MSRP) and will be available at authorized retailers and Klipsch.com in February 2014. Combining high-performance Klipsch audio with the convenience of wireless freedom, the KG-300 Wireless gaming headset grants users four EQ presets (Fidelity, Combat, Stealth and Sport) optimized for both stereo and surround sound. A detachable flex boom mic, Dolby® Digital Decoding and proprietary Klipsch SphereSpace Surround Technology bring the sensation of the game to life. The headset utilizes athletic mesh ear pads for maximum comfort and employs 40-millimeter drivers tuned for gaming accuracy. Three AAA batteries provide hours of wireless gaming freedom. 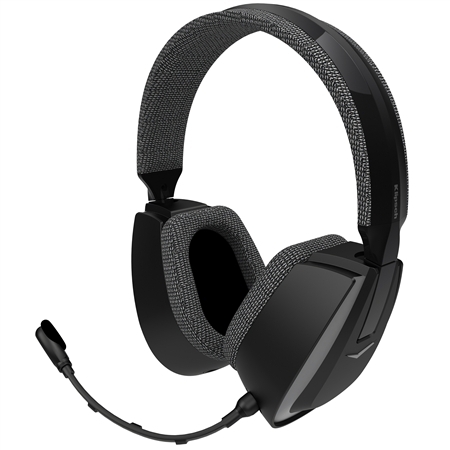 Similar to the KG-200, controls for EQ, chat volume, game volume and mic monitor are ergonomically placed on the headset’s right earcup. The KG-300 retails for $199.99 (U.S. MSRP) and will be available at authorized retailers and Klipsch.com in February 2014.